Served as an appetizer — or even as a side dish — this bite-size Buffalo Roasted Cauliflower is crispy, tangy, and very flavorful! Whether you love everything buffalo or are looking for a healthy chicken wings alternative for the big game, you can feel good about this cauliflower recipe. Let’s face it, cauliflower all on its own is not all that impressive. As a child, I could not be convinced to eat cauliflower unless it was smothered with cheese sauce — lots of cheese sauce. 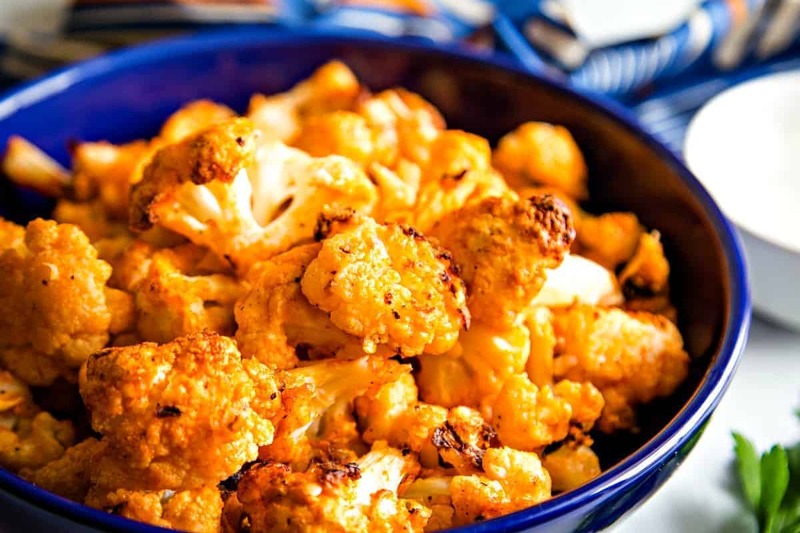 But now, I’m starting to actually enjoy cauliflower, especially when it’s roasted and seasoned well like with this tasty recipe. Add celery sticks and Ranch or blue cheese dressing to create a yummy party buffalo platter. Buffalo fever has taken the country by storm! My daughter would eat buffalo sauce on ANYTHING and was the one who introduced me to the idea of buffalo cauliflower. I was skeptical at first, but it is actually very tasty! 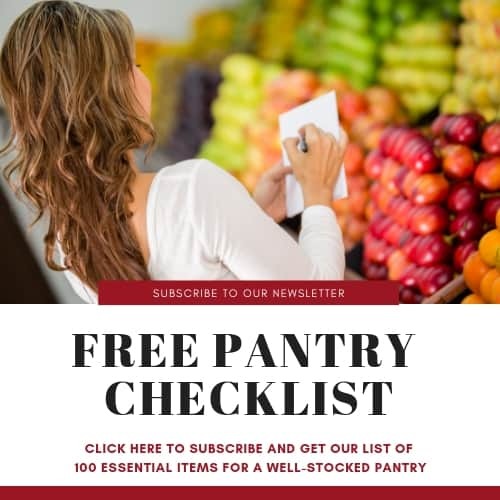 Preheat the oven to 425 degrees – don’t skip this step! Starting with a hot oven will allow the veggies to immediately start to oven-fry. Completely coat the cauliflower in a slurry, which is a mixture of flour and water. Typically, a slurry is used to thicken soups or stews, but in this case, the slurry acts as the breading for the veggies and also gives the buffalo sauce something to cling to later in the baking process. Don’t overcrowd the baking pan. Lightly coat a non-stick baking sheet with cooking spray, then place the coated and well-drained cauliflower (a slotted spoon works well for this) on the pan leaving some space for air to circulate. 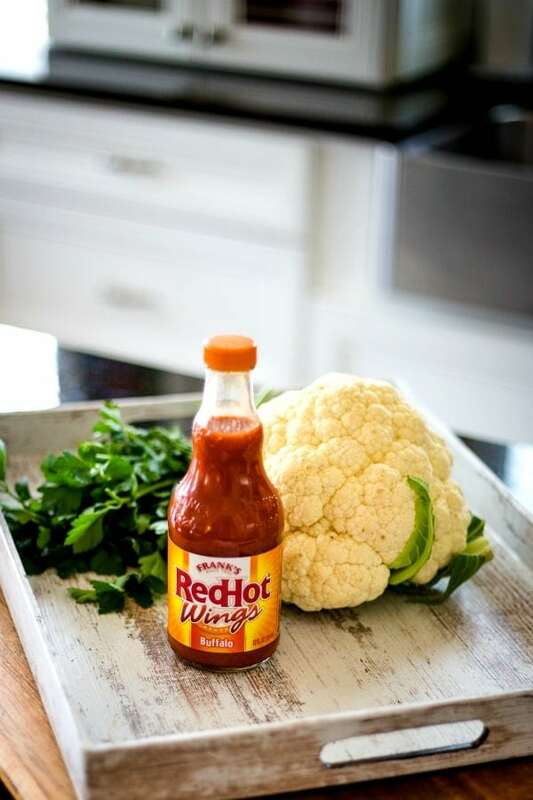 Once the cauliflower has roasted and has a crispy coating, baste each floret with a mixture of Frank’s Red Hot Wing Sauce, a little melted butter, and a bit of honey for sweetness. 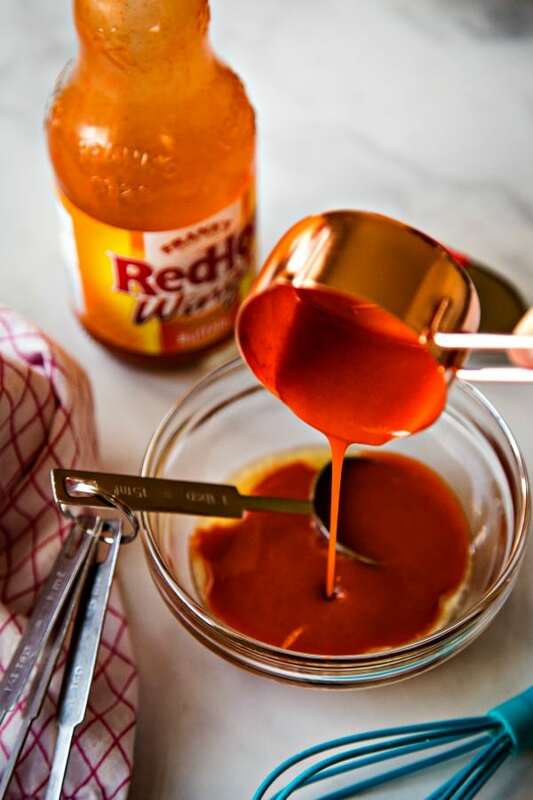 You can adjust the amount of honey to your taste, but I like to add a tablespoon to one-third cup of the wing sauce. 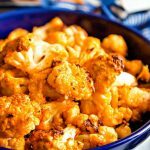 Did you make this Buffalo Roasted Cauliflower recipe? 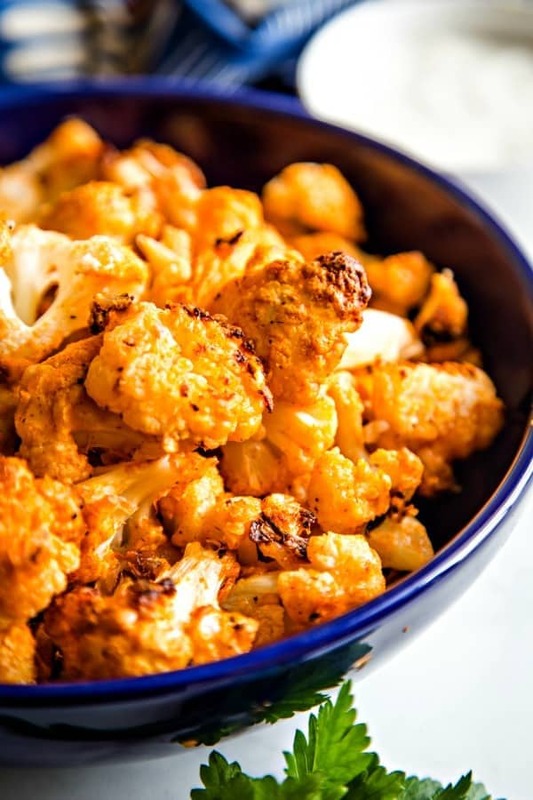 Served as an appetizer — or even as a side dish — this bite-size Buffalo Roasted Cauliflower is crispy, tangy, and very flavorful! Preheat oven to 425 degrees. 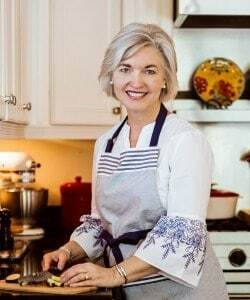 Lightly coat a rimmed baking sheet with cooking spray; set aside. In a large bowl, whisk together the flour, water, garlic powder and pepper until smooth. Put half of the cauliflower pieces into the bowl and stir to coat all the pieces. 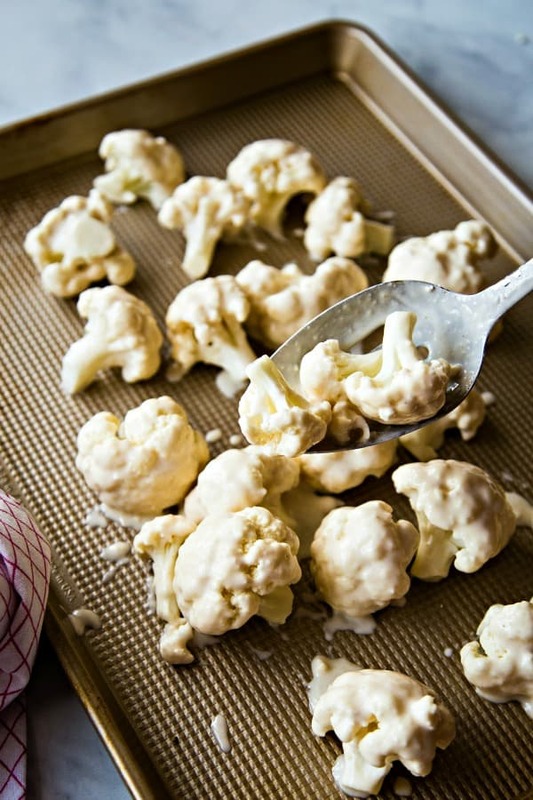 Use a slotted spoon to transfer the coated cauliflower to the baking sheet, letting the excess batter drip back into the bowl. Repeat with the remaining cauliflower. Bake for 35 minutes. White the cauliflower is baking, stir together the buffalo sauce, melted butter, and honey in a small bowl. 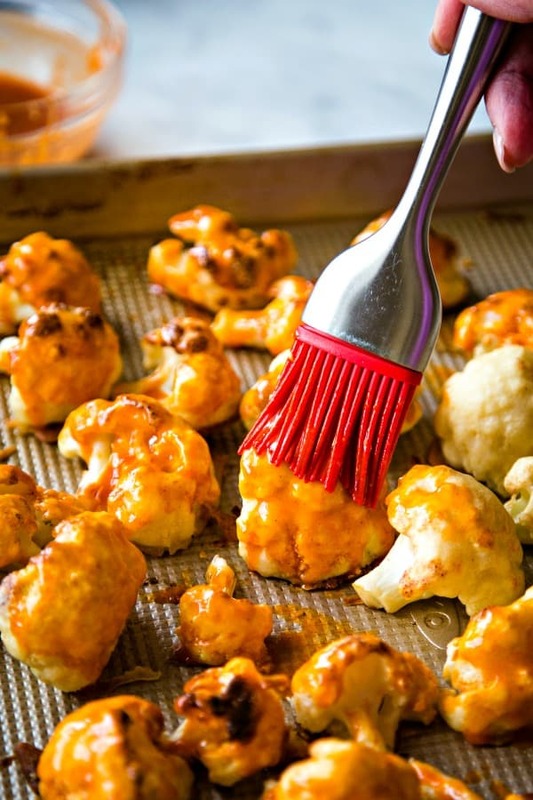 Remove the cauliflower from the oven and brush each piece with the buffalo sauce mixture. Return to the oven for 10 more minutes or until slightly crisp. Serve with a side of Ranch or blue cheese dressing.